The LCD version of Eternal Champions is a handheld game created by Beck-Tech for Tiger Electronics and released as part of their Pocket Arcade series of LCD handhelds. It is based on the Sega Mega Drive game, Eternal Champions. 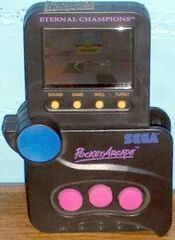 This was one of the first Pocket Arcade games to be created, and was designed by cartoonist I.B. Nelson in the space of a month.